This is the birth star of Chandra. Many constellations gather at the tail end of Krithika group. It extends from Mesa 26:40. 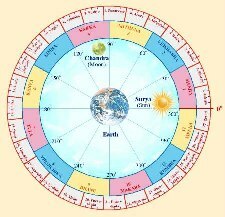 The residuary 10: degree fall in Vrishabha. The Devata is Agni, Lord (Adhipati) is Mangal and Sukar. Agni is the great purifier, the great consumer of and the giver of light, heat and brightness. While he is very intelligent on one hand, he cannot pursue any goal for long on the other hand. In other words he easily gets bored with a particular thing and switches to another one without weighing the pros and cons. He is capable of rendering good advice and guides others in any problem. As far as his own life is concerned, he does what he thinks at a particular time. He will discard any friendship if it confronts his ego and freedom. At the same time he would not like to achieve name, fame and wealth through unfair means or at the mercy of others. His needs or wants are neither unreasonable nor his accumulations always spectacular, although his money making abilities are often phenomenal, his motivation, however, is derived from an emphatic wish to remain free from obligations. He cannot find fault in his own actions. Optimism followed with self-pride is one of the characteristics strongly displayed. He is determined to go ahead with great energy and shows a stubborn and tenacious nature. He is a combination of orthodoxy and monotheism, i.e. while he is orthodox he does not believe in age-old beliefs and customs followed blindly by the people. Persistent effort and hard work are his motto. He is eager to render a positive service to the world but is unable to shine for long. He involves himself in social life sincerely but loss and failure is all he gets. This drawback is attributed to the lack of ability to make the right move as per the situation. He tries to impose certain restrictions and control through self-assessment and modifies them according to his sweet will. Once a promise is made, it will be fulfilled at any cost. On a social front he can earn name, fame and respect. An excess of sincerity will lead him to a downfall. Frustrations start haunting him even for trivial matters leading to an outburst. Once he loses his temper the subsequent steps taken by him can prove dangerous. Hence, he should keep and maintain his peace of mind to avoid any sudden outbursts. He shows a remarkable arguments and counter arguments ability supplemented with logical reasoning. It is quite often seen that the ones born in Krittika are bereft of truth and money and go for unnecessary traveling. They are thankless and will utter cruel words.